It’s pretty much guaranteed, in our house, when I ask the question of my husband “where would you like to eat out tonight?” that he will pick one of his favorite Mexican restaurants. So, it’s also pretty much guaranteed that I have a long list of Mexican recipes that I will be trying at home, but in a skinnier version. 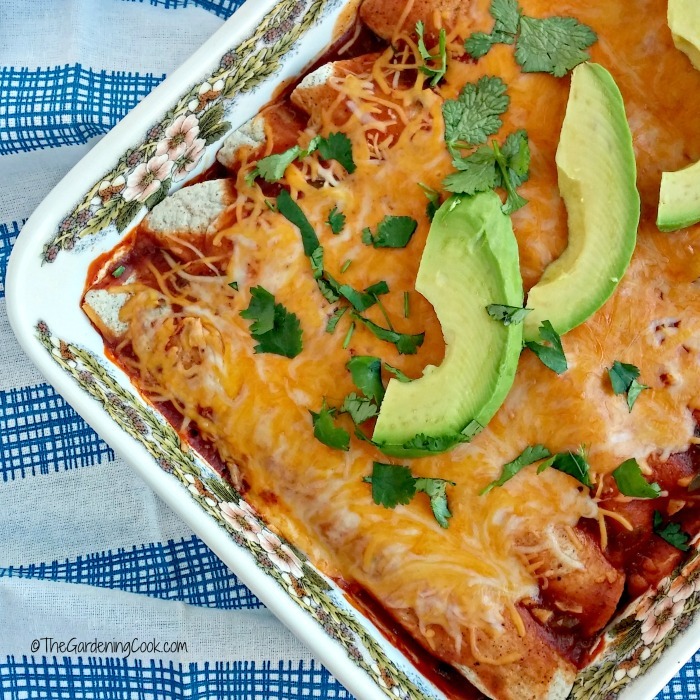 These Skinny Ground Turkey Enchiladas are my latest attempt and we both loved them. 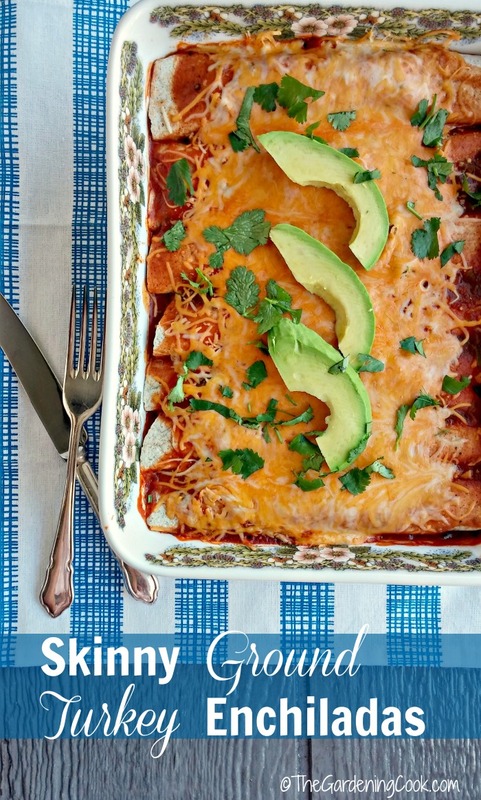 It’s Mexican Night at our House with these Skinny Ground Turkey Enchiladas. Ground turkey is such a great way to keep the calories down in recipes when it’s substituted for ground beef. 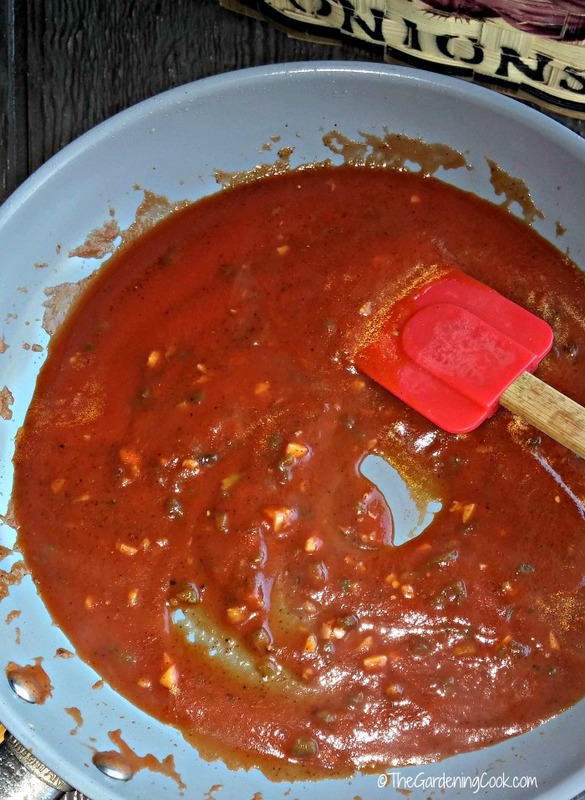 You can use a bought enchilada sauce, but it is very easy to make a home made version in about 10 minutes so that is what I chose to do this time. I use a whole wheat tortilla wrap from Ole Mexican Foods. Each wrap has only 50 calories and packs 11 grams of fiber into each wrap. And they are also very low in fat. 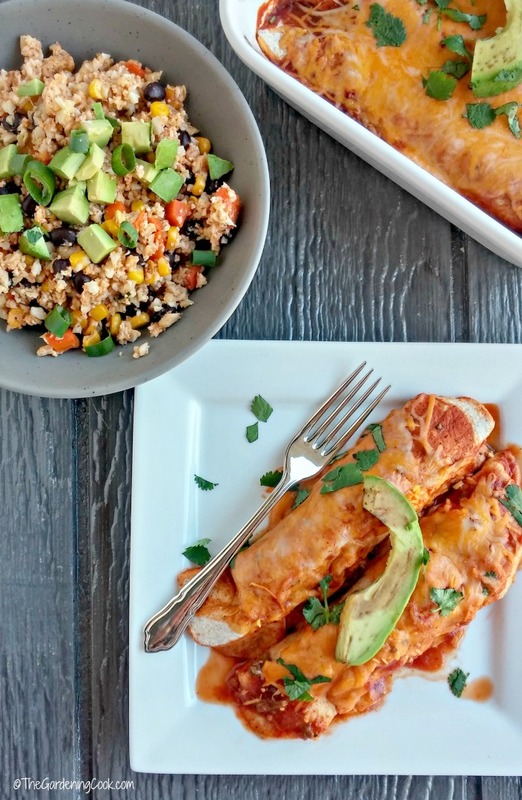 They make the perfect choice for these skinny enchiladas. Look at all the goodies that will go into this recipe! I can’t wait to try them. Seriously, folks. You will never guess that this recipe has been really slimmed down from the normal enchilada recipe. It is full of flavor, and rivals the enchiladas at my local Mexican restaurant, without all the calories that go along with those! 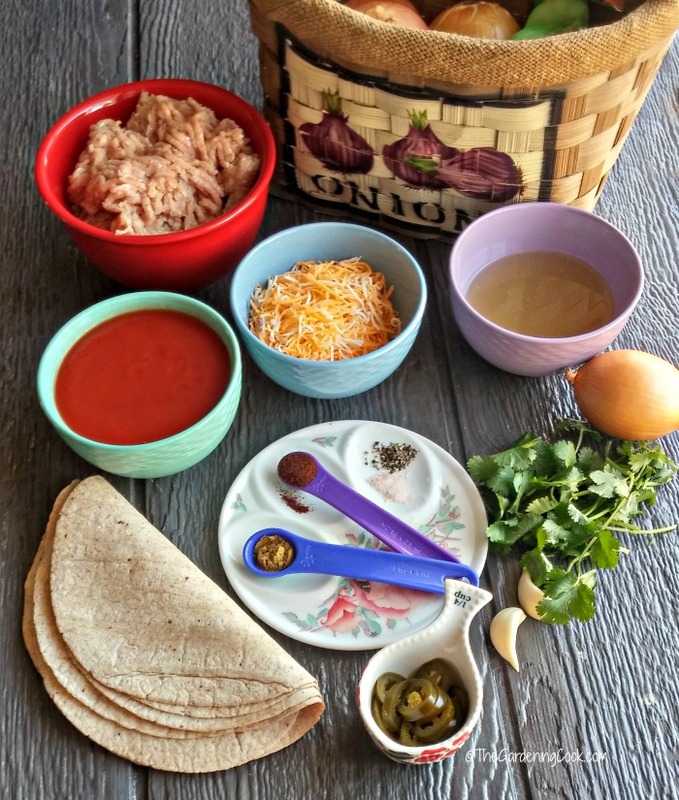 I like to serve these skinny ground turkey enchiladas with my cauliflower “Mexican rice” to add a delicious side dish that still keeps the calorie count low for the finished meal. What is your way to slim down one of your favorite restaurant meals? Please let us know in the comments below. 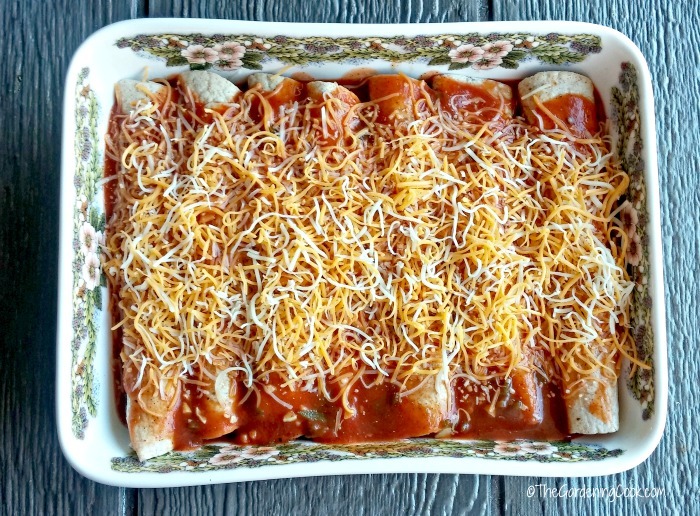 These Skinny Ground Turkey Enchiladas are my latest attempt at our Mexican favorite and my family loved them. Spray a medium non stick saucepan with Pam, and sauté 2 cloves of minced garlic. Add the chilis, chili powder, cumin, chicken broth, tomato sauce, salt and pepper. Heat the olive oil in a skillet over medium-high heat. Sauté onions and garlic until soft, about 2 minutes. Add the ground turkey and cook until no longer pink , Season with salt, cilantro, cumin, oregano, and chili powder. Add the tomato sauce, chicken broth, and cook 4 to 5 minutes. Remove from heat. Spray a 13 by 9-inch glass baking dish with non-stick spray. Put 1/3 cup of the turkey mixture into each tortilla and roll it. Place the filled tortilla on a baking dish seam side down, and top with prepared enchilada sauce, then add the shredded cheese. Cover with aluminum foil and bake in the oven on the middle rack for 20-25 minutes.Top with low fat sour cream, avocados, or cilantro if you wish. Makes 8 enchiladas. Thanks Barbara. My husband just loved them! This looks very delicious and healthy. Thanks for sharing. We love Mexican food too!! And this recipe sounds healthy AND delicious! 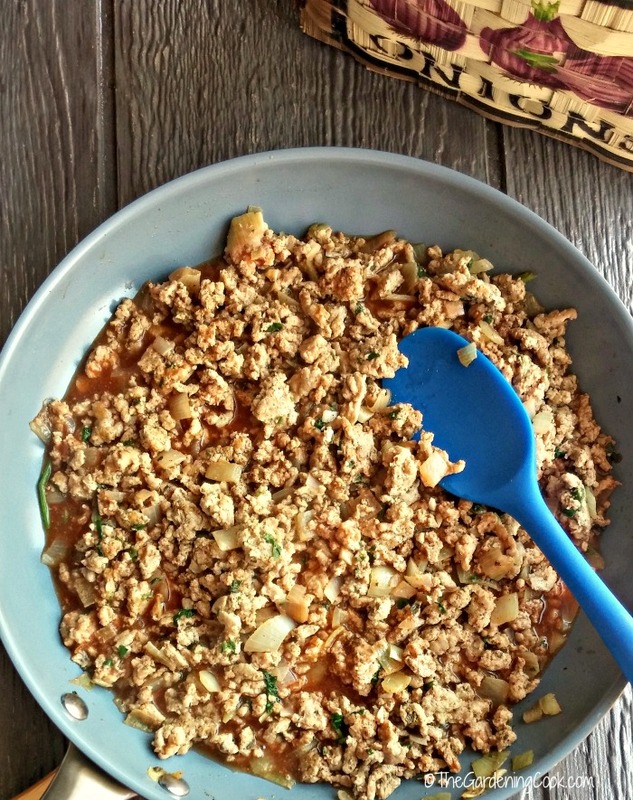 I use ground turkey a lot in place of ground beef – chili, bolognese, Shepherds pie. It’s such a healthy alternative (and these days it’s a lot cheaper – at least here in Canada). I’ve been using it a lot more too. It is very versatile. The ground Turkey filling recipe tastes delicious. I made my own enchilada sauce, added sliced olives, and used homemade corn tortillas and fresh Oregano from my sister’s herb garden. My husband opted for seconds and raved about this dish. It’s a keeper! Thank you so much for sharing your creation with us! By the way, I agree with Heather, we substitute organic ground Turkey for ground Beef in most cases. It’s so much lower in fat than beef.